I've mentioned before that when I was younger, my parents owned a restaurant and at the beginning, they weren't very experienced at cooking and baking for large groups of people. So, they asked for help from family members for any tips and tricks that they might have had. Some of my aunts, uncles and grandparents even came to the restaurant to cook and bake all sorts of things: big batches of spaghetti sauce, sweet and savory pies and of course, homemade bread. I remember that day my uncle came over to bake bread for the first time. I think he was real happy to have a restaurant kitchen to work in, I mean how often is it that you have a huge kitchen with counter space galore and multiple ovens at your disposal? And I think he didn't mind that my brother and I looked on in awe of his bread baking skills. At the time, for me anyways, bread was one of those things you only could get at the store; seeing someone make it by hand was totally impressive. The precise measuring of the ingredients, waiting for the first rise, shaping the loaves, waiting for the second rise and then, my favorite part, the aroma that filled the whole restaurant while the bread was baking! The entire process fascinated me, it was almost magical. Taking raw ingredients, doing a little mixing and ending up with something completely different! Just fascinating. Fast forward to today and although I know some people find working with yeast intimidating, for me, it's very therapeutic. I find the measuring and mixing and kneading quite relaxing. Which is why I think it's a bit ironic that I like baking no-knead bread so much. It feels almost like cheating! Very little measuring, very little mixing, very little work at all, renders a loaf worthy of any bakery I've ever visited. This particular variation on the famous no-knead bread is delicious paired with different cheeses as part of a cheese platter or simply eaten as is, toasted and spread with a bit of salted butter. In a large bowl, combine flours, yeast and salt. Add water and stir until blended; dough will be shaggy and sticky. Cover bowl with plastic wrap. Let dough rest at least 12 hours, preferably 18, at warm room temperature, about 70 degrees. Dough is ready when its surface is dotted with bubbles. Lightly flour a work surface and place dough on it. Cover loosely with plastic wrap and let rest for 15 minutes. Flatten dough out lightly and add the walnuts and cherries. Adding just enough flour so the dough doesn't stick to your fingers or your work surface, fold the dough over the add-ins and knead a few times to mix them in. Some of the walnuts and cherries will fall out and the dough will be a bit tough to work with but form it into a ball as best you can. 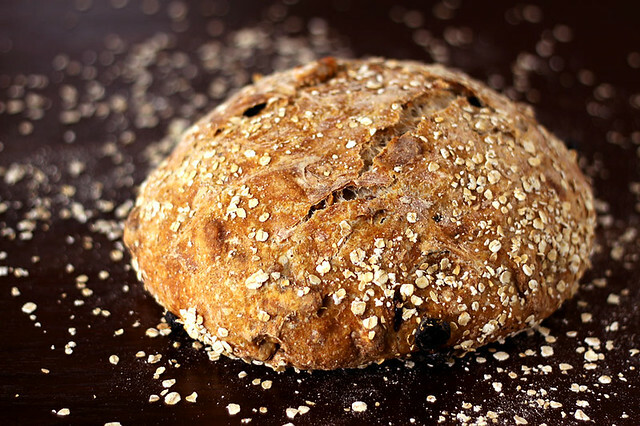 Generously sprinkle some oats on a large sheet of parchment paper and place your ball of dough onto it. Sprinkle the dough with more oats and cover with a clean kitchen towel. Let rise for about 2 hours. When it is ready, the dough will be more than doubled in size and will not readily spring back when poked with a finger. At least a half hour before the dough is ready, heat oven to 450 degrees F. Put a 4- to 8-quart heavy covered pot (cast iron,enamel, Pyrex or ceramic) in the oven, as it heats. When the dough is ready, carefully remove pot from oven. Slide your hand under the parchment paper and turn dough over into the pot; it may look like a mess but that is O.K. Shake pan once or twice if dough is unevenly distributed; it will straighten out as it bakes. Cover with lid and bake for 30 minutes, then remove lid and bake for another 30 to 40 minutes, until loaf is beautifully browned. Cool completely on a wire rack. What a great story! The bread looks so delicious! i generally find bread-making to be a calming experience as well, but when it fails (as it sometimes does, no matter how good you are! ), it shatters me. i love all the goodies inside your loaf! Nice recipe really. How does it taste? My guests are coming on my birth day party I will make for them. Thanks all! I realized I didn't describe just how tasty this bread was! It's just a bit sweet/tart from the cherries, the crust is perfectly crunchy and the creaminess of the walnuts just balances everything out perfectly. Hope this helps! Amazing. I have a sponge going with oatmeal and raisins. 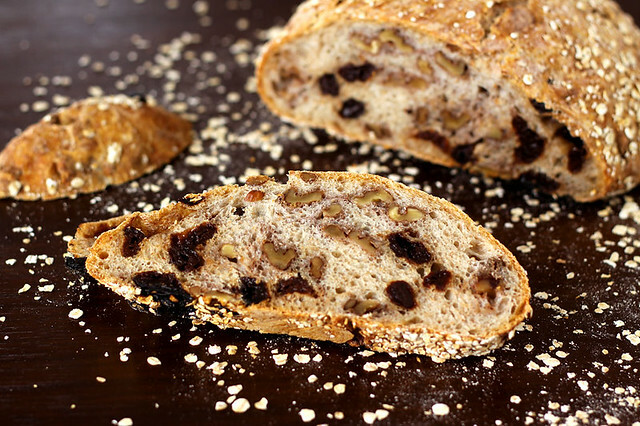 Walnuts and cranberries would be amazing - I bet it would be amazing with cacoa nibs! What a beautiful boulle; we've been making this recipe for years! Love the nuts and cherries, very clever. That's a really nice recipe, I wish I could beak bread as well!!! For me baking the bread is a real art. I have neber baked a bread by myself, especially so beautiful.